Birdwatching Can Get Political... if you are in Canada. Mary Ann and I both belong to a club called the Kitchener Waterloo Field Naturalists. It would be unkind of me to call them (I mean us) birdwatchers, because we are much more. In addition to watching, and counting, species of birds, we are also watching trees, flowers, mosses, insects, fungi, salamanders and lichen. And probably a lot more, since I am not one of the most observant members of that club. It came to my attention that there was a CBC news item about the club. The story is that the Federal Tax department (CRA) sent a letter to the KWFN, warning them to not get too political. Apparently, the club had sent a letter or two to politicians, urging that (a) bees were at risk due to some chemical spray, and (b) the Ontario Government should not water down the "Endangered Species Act". Now, I know that feelings can sometimes start running high about threats of a tax audit. At least one member of the club was willing to speak to CBC reporters about his feelings of being muzzled by the Federal Government (in the embedded video). "Follow the rules like everyone else...or drop your charitable status and do it on your own." I want to take an objective position here, and try to be fair about this news story. First, the CRA did in their letter admit that the KWFN had done nothing wrong. So why did the KWFN get a warning letter? Because in their official financial statement, they had reported 0 dollars under political expenses. Since writing two letters can easily cost you a few dollars postage*, the CRA merely was reminding the club that it should report this as a political expense. The Federal government has decided it is political to write a letter to politicians urging them to pass or amend laws. And once the political expenses get over 10% of your budget, you are deemed too political, and must abandon your tax free status. The KWFN also had a speaker at one meeting talking about the tar sands, and urged members via their website to look into the David Suzuki "Blue Dot" tour. All these things could cost money- so many megabytes of web space, and honorariums for speakers. The CRA, for its own part also has to be very careful to not give the appearance of partisan bias. So they have to be very careful to investigate conservative bird watching clubs just as much as liberal bird watching clubs. It's the same when they are investigating millions of dollars being hidden offshore by wealthy Canadians. They cannot investigate just the liberal minded tax avoiders, they must pay equal attention to conservatives hiding their money offshore. And I guess they have been pretty non-partisan about the whole thing, because the CRA don't really have the budget to investigate any offshore banking (liberal or conservative), while they do have an increase in their budget to check out virtually all birdwatching clubs in Canada for unreported political activity, liberal or conservative alike. So I don't think there is really all that much muzzling for us free Canadian citizens to be concerned about. As long as you correctly report your expenses when sending a letter to your member of parliament, you will be fine. All this brouhaha is actually the fault of the Green Party. Because of their party platform, caring for the environment has become a political thing. And if some other party opposes the Green Party, then caring for nature and the environment becomes not only political, but partisan. I predict that one day, some political party will make it a policy to destroy the environment. From that day on, any club that enjoys preserving nature will be automatically be considered a partisan political group. Here is a link to another blogger who has commented on this story, but he is not as even handed as I was in my judgment. Where is the Real Disappointment? Are Americans nuts, or is this a Russian ploy to take over the world? But it does seem that many Americans are disappointed with Obama. Especially those who listen to Fox News, but the disappointment is spilling over to other outlets, such as the Washington Post and CNN. I saw part of a program on CNN titled "Is Obama the "Disappointer-in-Chief"? And then I found an article on the Washington Post website titled "Barack Obama, disappointer in chief" by Aaron David Miller. Speaking as a Canadian, who was relieved to see Obama win the 2008 election, I am not disappointed. Well, at least I am not disappointed by Obama except for one thing, there should have been some major prison sentences for the Bank CEO's who instead got huge bonuses from the bailout. But since I didn't pay for that bailout with my taxes, I guess I have nothing to complain about. But I can understand why many Americans feel disappointment. They look at presidents like George Washington, Abraham Lincoln, Franklin Delano Roosevelt, and JFK and they think that Obama simply doesn't measure up. Washington was the military genius who defeated Britain in the war of independence, Lincoln freed the slaves, FDR ended the depression and won two wars (counting Germany and Japan separately), JFK was a very nice looking president who would have done more if they had not killed him. Compared to those guys, Obama seems to be just a pretender to the title of Best. President. Ever. My own interest was mainly in recovering the US (and Canadian) economy, which was teetering on the brink of collapse. Actually, I'm pretty sure that the Republicans under Palin and McCain would have recovered the economy too, as they were already involved in bailing out the banks under President Bush. But now I'm starting to worry that the Republicans will gain power yet again, and start another war and crash the economy like they did last time. Especially if they cannot learn any lessons from the Democrats who were able to steer the country away from disaster under Obama. And P.S. 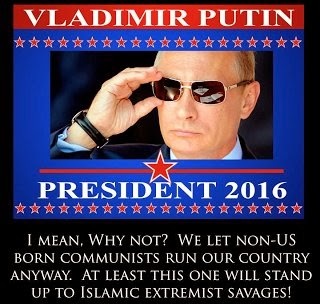 for the Fox News announcers wailing that we need Mr. Putin as president of the U.S.A. Are you nuts? It's one thing to whine about everything Obama does, from mustard on a hamburger to his high(normal)-rise blue jeans. But to wish for Putin as president? Well, I'm sure he would "get things done", but he is now pretty much a dictator in his home country of Russia, and seems to have the same power as the Communist party did in the past. Are you really willing to give up freedom so easily just to be able to scare a few Arab terrorists in the Middle East? Now, that is disappointing.